PJ here. Today, I take a step away from romance with a review of a beautifully written, thought-provoking story that captures the heart and touches every emotion therein. Here are my thoughts on Dollbaby, the stunning new coming-of-age novel from Laura Lane McNeal. It was the sultry, and tumultuous, summer of 1964 when Liberty "Ibby" Bell's mother unceremoniously dumped her in front of her grandmother's home in New Orleans with nothing more than a single suitcase and an urn holding her father's ashes then drove off to "find herself." Eleven-year-old Ibby had barely begun to come to terms with her beloved father's untimely death and here she was, in a strange city, foisted upon her father's mother - an eccentric woman she'd never met and, until a few years earlier, hadn't even known existed - not to mention her grandmother's black cook and the cook's smart-mouthed daughter. Ibby had never even seen a black person before! Life as she had known it would never again be the same. Fannie Bell has lived in the old house on Prytania Street since she was a young bride; a house that has seen its fair share of joy and despair over the years. At one time, its walls reverberated with the laughter and running feet of exuberant children but for the past twelve years, since Fannie's dear son married "that woman" and moved north, it has only held painful memories of the past for a woman who battles untold demons. When her son's daughter appears on her doorstep, Fannie is determined to not waste the second chance she's been given but when her demons reappear it's up to Queenie and Dollbaby to hold things together. Queenie has always known her place and been content with it. As Fannie's cook, she has done her best to keep the Bell household - and Miss Fannie - on track for more than thirty years. She probably knows Miss Fannie better than anyone; knows her strengths, her weaknesses, her secrets. It's Queenie who keeps things on an even keel but the unexpected arrival of Ibby has stirred things up within the old house on Prytania Street. And speaking of stirred up, Queenie's daughter Dollbaby is plenty stirred up. As a young woman of color, Dollbaby is not content with her lot in life. She's a woman with ambition, dreams and hidden resentments threatening to spill over. 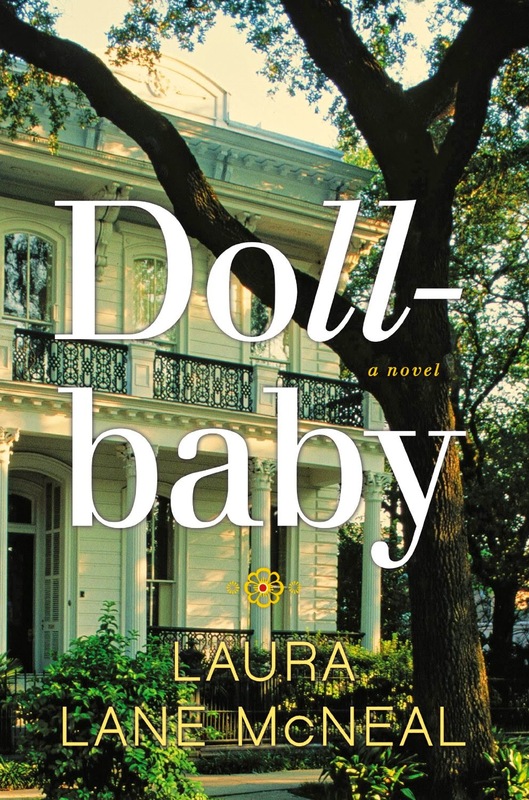 In Dollbaby, Laura Lane McNeal has expertly crafted an enthralling coming-of-age story set amidst a time of social upheaval in the American south. Spanning a period of eight years, it follows the story of four women - two white, two of color - as they navigate the sometimes perilous, sometimes humorous and frequently poignant emotional waters of their complex, sometimes complicated relationships. Through the thoughts and actions of the characters, the reader is given insight into the challenges and injustices of the time which vary not only by color but by generation as well. I don't know if the author experienced the sixties first hand but, as someone who was slightly older than Ibby at the time the story takes place, I can tell you that she captured the mood of the nation exceptionally well. But while the civil unrest of the sixties and the unique city of New Orleans are a rich backdrop for this story, it's the characters that provide the soul. Complex, multi-layered, fully developed characters with lessons to teach, lessons to learn, secrets to confront, truths to reveal, forgiveness offered...and love accepted. It's an enthralling, fascinating exploration of the complexities of class, race and gender in the pre-segregation south and how those facets are woven together to create the fabric of the relationship - no, of the family - formed by these women. It's a story you can sink your teeth into. Have you read Dollbaby? To me, it has the same rich southern flavor and evocative feel as Sue Monk Kidd's The Secret Life of Bees. Others have compared it to Kathryn Stockett's The Help. Do you enjoy coming-of-age stories? Have you been to New Orleans? What's your favorite memory of the city? Thanks to Nancy Berland at Nancy Berland Public Relations, Inc. for the giveaway copy. That sounds amazing! I want to read that!! Will have to put out a look for it. I loved The Help; and I love books set in the 1960s like this, it truly is like going into a different time period as exotic as the 1800s or 1200s. Hellie, I think you'd really enjoy this book. It's a fascinating character study. Having experienced the 1960's as a teen I can assure you that it was indeed a very unique - and fascinating - period of time. Hi Elizabeth! Like you, I'm enthralled by well-written coming-of-age stories. I was surprised to discover after finishing this book that it is McNeal's debut. I can't wait to see what she brings us next! Dollbaby sounds memorable and unforgettable. Coming of age stories are so meaningful and special. Wonderful post and best wishes and much continued success. I hope you give this one a try, petite. McNeal has created a very memorable story. I would love to read Dollbaby since it is profound and important. I haven't visited N.O. but this book would certainly give me the background and flavor of such a unique place. I enjoy coming of age stories for their beauty and emotions. McNeal does a wonderful job not only of bringing her characters to life but also the rich uniqueness of her hometown of New Orleans. I've read a few coming of age stories. This is one I'd love to read. The synopsis had me wanting more after the first paragraph. Thanks for the opportunity. I really enjoy coming of age stories and books where the location is part of story, almost to being a character. I read The Help in one day. A Target employee recommended the book and told me to make sure I didn't have any plans once I started reading. She was not kidding and we've talked books since. Laura, I would offer the same advice with Dollbaby. Once I started reading I couldn't put it down. Have you read The Secret Life of Bees? It's another that I highly recommend. I haven't yet read The Secret Life of Bees and will have to add it to the list. I've traveled extensively and have never encountered another like it. When my husband was stationed in Gulfport we visited New Orleans twice. One of his friends was from from around there and he took us to this place that served crawfish on a huge tray and you just dug in - wonderful. I've never tasted anything comparable since. And I enjoyed The Secret Life of Bees so this sounds like something I would enjoy too! I put Dollbaby on my wish list when you first mentioned it to me, PJ. I was already persuaded that I'd like it, and your review has prompted me to move it up on my to-be-bought list. Thank you for this most insightful and lovely review. You really captured the essence of my novel. I was a young child in the 60's and had some memories of the time but felt like an outsider looking in, as I was too young to understand what was going on. For this reason I made Ibby an outsider as well, one who could discover the culture and the conflicts for the first time. We have been to New Orleans twice and look forward to going back again. I think it is the mix of the old charm of the area and unpredictability that seems to reign. You can tap into which ever part of it you like. On our first trip, we didn't know what to expect. It was St. Patrick's Day while we were there. We happened upon the major parade down Bourbon Street. It was quite an eye opener and great fun. I can't imagine how much bigger Mardi Gras would be. It was the week before we got there. On our second trip, it was being able to ride the trolley cars with our daughter and her husband and daughter. It was enjoyable just riding around and seeing the sites. I enjoyed THE HELP, both the book and the movie. Coming of age stories are also favorites. They can take a wide variety of forms. I came of age during the 1960's. I witnessed first hand the impact on people and property after destructive riots. I experienced refusal of service or slowed service when with friends of color - black and asian. I was involved with a desegregation program in the Mount Vernon, NY schools. Interesting and sometimes frustrating. In NY I was discriminated against because I was with blacks, in California because I was with asian americans. Overseas I was discriminated both against and for because I was an American. None of them are particularly good feelings. I will be looking for DOLLBABY.